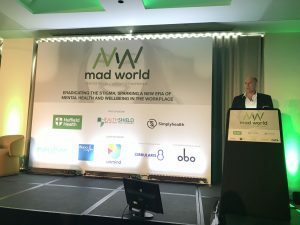 We have left MadWorldForum with two actions from Geoff McDonald, Global Advocate for Mental Health at Work, previously Global VP HR, Unilever. Action 1: “How do you get leaders of organisations get emotionally engaged with their mental health”? For someone who devoted the last few years to the workplace wellbeing it was very refreshing to hear. Suddenly workplace wellbeing is not an intangible fluffy activity but a strategic business priority. As Geoff put it: “Energy and Health are the most important drivers of people performance”. And most employers have been taking employee health and energy for granted that resulted in a major health crisis. It is time to invest in your people health and energy. Prof. Sir Cary Cooper provided us with some critical business stats. 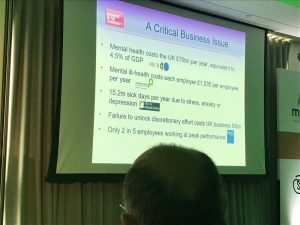 “Presenteeism is still a big issue. Line managers don’t know how to manage people.” He asked businesses to look at the job design, organisational cultures and flexible working. Who is going to disagree? But these topics have been on HR agenda for the last 10 years at least and we still cannot get them resolved. Trust? – Do we trust our people? Kristoff DuBose, Founder of Cirkularis8 believes that we are still stuck in the industrial age when it comes to our workplace design and organisational hierarchy. It is time to re-invent our working spaces to reflect the new age of the knowledge and creative economy. Change comes from within. Begin with yourself. Sir Anthony Sheldon tells us that what we really need is to close our eyes and take a deep slow inhale and exhale as often as we can. Beautiful profound advice that our minds are so sceptical about. I will leave this one with you. 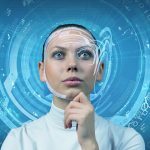 If you prefer a more scientific explanation to this simple advice a session with Mia Vanstraelen, HR Director of IBM and Nick Taylor, CEO Unmind could have shown you how you can change your behaviours and the behaviours of your teams with neuroscience. Simple actions taken daily can start changing your brain in a positive way . 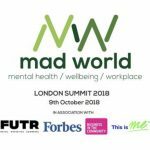 Jonny Jacobs, Strategy&Transformation Director, Pladis confirmed that positive psychology is something they take seriously at work since one of their employees committed suicide. Our mind can take us in a very dark place so we need to learn how manage it. Lloyd Dean, Head of Digital and Innovative Learning makes it his business priority to talk about mental health especially amongst men. “It is often that only through our personal journeys we realise the importance of these conversations”, he adds. Will the generation of leaders pave the way to our happiness and wellbeing at work? 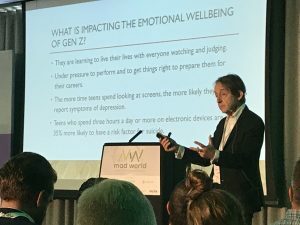 There is certainly a hope after we heard Kiera Lawlor, Social Chain, Tom Foster-Carter, Monzo Bank and Becs Bestlee, DICE speak of their approach to wellbeing at work. Refreshing, honest and thought-provoking accounts on how to prevent mental health issues at work in a very personable, caring and impactful manner. And yes – it costs them money and time but they know their people are worthy of it. In the closing note Geoff McDonald talked about his personal journey, a sense of purpose, meaning and love that guide us and support in life. Yes, Love – we all need to know that we are loved.